Review by Jehovah on 2/1/2014. Brilliant! Possibly the prettiest map in WL.the hot air balloon, the shipwreck, the house by the waterfalls, etc, well done! Review by ♈§IRIÜS♈ on 3/20/2013. Review by lexical_enumeration on 2/9/2014. Review by Lummpy on 9/24/2013. Small, interesting map. I thought the 3D touch to the terrain was a great addition. Review by Nathan on 6/18/2013. The AI can get pretty nasty on this map. Review by Niko on 7/17/2013. Review by Rickroadkill on 7/19/2015. Really great map. I love the size, and the territories / reinforcement zones. The art is honestly amazing. Review by Landalf on 7/23/2013. very well done.. I think the choke points are one too many, but at the same time it makes it interesting. Review by Archon on 5/13/2015. Review by Ken Jonks on 6/19/2016. Very beautiful and balanced fantasy-map! is truly nice and agreeable. Very playable also. Review by Jazz on 5/6/2015. Review by Thomas on 12/9/2015. Review by Captain Ercoupe on 10/21/2016. Lots of fun. Balance between areas with choke points and open areas. I tweaked the bonuses a bit and created more 4 and some 5 bonus areas where 5 or 6 territories were needed to get the bonus. Review by Mistrals on 6/7/2017. Review by Simon Swierczynski on 7/22/2017. Review by Dragon Drachenreiter on 7/22/2017. Review by Amal Alili on 3/2/2018. Review by Steve on 2/27/2019. Review by FlyingBender on 8/6/2013. Review by OTPM on 11/24/2014. The territories aren't too varied in size. There aren't too many confusing connections. The map is sized so that I only need to scroll across one plane (vertically). 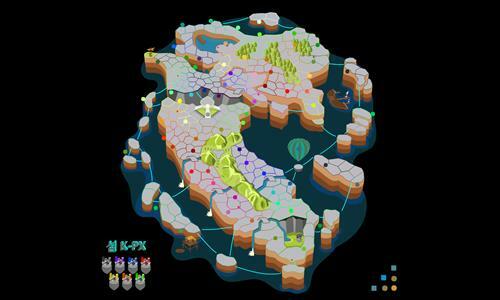 The map consists of lots of islands. Even parts on the mainland are similar to islands with just 1 few points to defend to maintain control over a region. Review by Alpha188 on 8/14/2013. Review by BloodBath185 on 3/22/2013. Review by J0kerz on 7/5/2013. 1 out of 12 people found this review helpful. Review by Krosstout on 4/11/2013. 2 out of 23 people found this review helpful.